To me, this was supposed to be a temporary thing, a thing that would take up a few days of my time for now and will be cast away until I remember it again, but unfortunately or fortunately enough I did that for a month or two and then it took control of my life. I can’t remember the date quite exactly but I remember it was shortly after another anniversary which I had on that same day. You see this date is very special to me, because it marks my relationship with my loved one. My blog, my baby, is turning 1 today. And my relationship is turning 3 today. 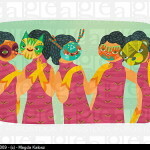 It is really an outstanding day to start blogging and all. Anyhow, I really can’t begin to describe how blogging has become theraputic to me, how it is a way to vent out my inner frustrations, my inner most feelings, my love, my passions, and my crazy-ness. It is a place seriously where I can call home. Where I can be most at ease with myself. I know I should have planned something big today. The big thing that was supposed to be today is the move from Blogger to WordPress but I did that earlier. So it can’t be counted. But, to me I don’t need to do anything else special because seriously it already feels more than home to me. I’d just like to take a moment here to thank everyone of you who has made my blogging experience a rather good one, who has commented, who has shared, and read every single post from Day one until today. It truly means the world to me. I love you, you, and you. I love my Blog, I love my love, I love my rants, I love my readers most of all. Thank you alls, I know I shouldn’t play favorites just yet but I can’t really not recognize my most faithful readers & Purgatory72 (My very first Kuwaiti Commenter I believe). He really has watched this blog grow and change and inserted his input many times. And dahling, i don’t see moi mentioned there ;p hehe, erm, i was probably the first Egyptian commenter, hehehe! Dahling, congrats again and insha2alla we’ll celebrate again 17/05/2006!! yay! Hang on, when’s my blog’s first anniversary? hmmm, o well! Your first entry was quite funny, u used a couple of Arabic words in there! hehehe…Your writing has grown with this blog, yay! Yay! I feel loved! woohoo!! I get a little “update” section!! Definatley a reason to gloat for!! you also have become one of my best friends online, and through you I met other nice people. Now Although I was not invited with you three (shame on you), I would like to wish you a happy anniversary and many more to come, though I am not sure how long you will continue, but I will “force” you to continue until I say you can stop. Not to forget that you were the first one that welcomed me to this comunity.. I will never forget that..
Purgy, yes i was trying to steal some of your thunder, and i succeeded, MUHAHAHAHAHA!!! See, I have a big influence on the blog-o-sphere :p, wonder what else I can credit to myself? Anyone interested in taking a shot? I’m naughty?! OoOo!! hehehe, i like that! One full year! Congradulations! Keep it up. 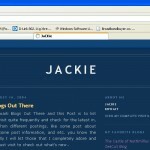 lol jackie… if u would be blogging on ur wedding night then i would really be worried…. Symbols, why do you like being naughty? :P Do you want P4 to come after you with his whip?! Woot! Yay! 1 year of looovviiin’! Lol, I really have no idea what I just typed. I should stop. You’re swell Jacqui and I hope you continue being friends with me even though I’m hard to put up with and I hope you contine the GREAT job you’ve done with your blog. Constantly updating and fixing every little thing till your blog is perfect unlike most of the other lazy bloggers (namely me) :P Take care of you, Laters!